I figured out that the Google Earth image posted by Kim was cut by a famous fault, so I have a chance to post the next installment of Where on (Google) Earth. I don’t think this is easy – it is certainly not a famous geologic locality, and I know it would be tough for me. 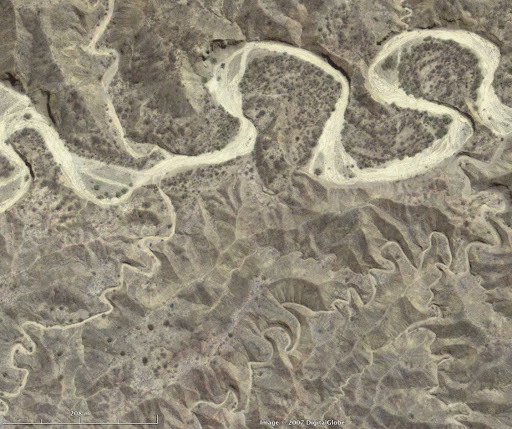 But I have been interested in erosional meanders for some time, so here you go. North is up. Update — hint: it is in a forearc basin. 4º15’14” S 81º00’29” WThe Talara Basin, Peru. I was working my way north from the Atacama until your post above sent me to the right spot. Despite the really small size of the shot, in retrospect it was easy to narrow down once you gave the forearc clue. The Andes were by far the most promising global spot on account of aridity, but the vast majority of the rivers here – especially the larger ones – flow west, whereas the puzzle one evidently flows east. I spent a lot of time looking for eastward flowing meandering rivers, but too far south!good puzzle! I can’t resist restarting my blog – I will post a new one for everyone shortly. The eastward flowing river was not picked on purpose; I realized that was an unnecessary additional difficulty after I posted the image 🙂 .